The Earth is dying. Humanity  over-breeding, over-consuming  is destroying the very planet they call home. Multinational corporations despoil the environment, market genetically modified crops to control the food supply, and use their wealth and influence and private armies to crush anything, and anyone, that gets in the way of their profits. Nothing human can stop them. But something unhuman might. Once they did not fear the sun. Once they could breathe the air and sleep where they chose. But now they can rest only within the uncontaminated soil of Mother Earthand the time has come for them to fight back against the ruthless corporations that threaten their immortal existence. They are the last guardians of paradise, more than human but less than angels. They call themselves the Arcadians. 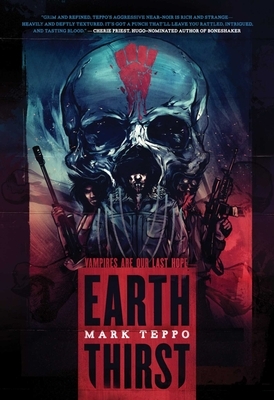 We know them as vampires. . . .
Mark Teppo (born May 21, 1968) is an American author of contemporary fantasy and science fiction. His work is strongly peppered with references to occult concepts, most commonly those of Hermeticism and Alchemy. Prior to his current tenure as a fiction writer Teppo was a music journalist working both as a staff reviewer and editor for various publications such as Earpollution, Igloo Magazine, Earplug, and OPi8.com. Teppo is also Chief Creative Officer of Subutai Corporation, whose first offering is the interactive fiction project The Mongoliad.